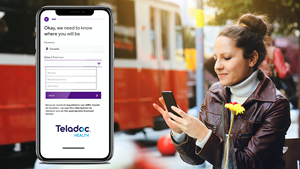 TORONTO, March 28, 2019 (GLOBE NEWSWIRE) -- Teladoc Health (NYSE: TDOC), the global leader in virtual care, announces today the launch of Teladoc Telemedicine Services, the first-of-its-kind offering to provide Canadians with 24x7 access to convenient, high-quality medical care regardless of their location across the country. The new service addresses head-on the healthcare access issues Canadians are facing in terms of overcrowded emergency rooms, physician shortages, and long wait times, which have been persistent in rural and urban areas alike. It also supports efforts of employers to address illness-related productivity issues. With Teladoc Telemedicine Services, Canadians will have access to convenient, high-quality medical care, whenever they need it, across the country. Barriers surrounding access to healthcare in Canada are well documented. According to Statistics Canada, approximately 5 million Canadians over the age of 12 do not have a regular care provider1, and for those who do, same- or next-day appointments are difficult to obtain2. In rural areas, only 8 per cent of Canadian physicians are reported to be practicing, with the majority located in and around urban hubs3 . Patients can be left with the choice to skip care or seek it via emergency room visits, while employers often absorb the impact of absenteeism, costing the Canadian economy $16.6 billion dollars annually4. For more information, visit http://go.teladoc.com/telemedicinecanada.